Similar to a food journal, an exercise journal allows you to track your progress and to find out what is working best for you. It's an ideal place for noting what you did, why, and to express yourself. Recording fitness information is great but venting our feelings is also an important and necessary part of the process of creating a healthy fitness habit. Write in your exercise journal every day even if you did no exercise. If you didn't do anything, think about why and add that to the book. It will take some trial and error but eventually you really will figure out what is in your way (mentally, physically, emotionally) and then you can make changes. A blank page tells you nothing and robs you of the opportunity to learn about yourself. It may not seem significant at the time, but jot it down anyway. Often it is only when you look back that you will begin to get useful information. 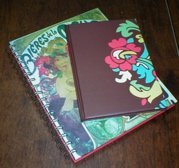 An exercise journal is a HUGE component in seeing patterns. We humans are complex and fascinating beings, but we ARE creatures of habit. Once you figure out how to create an exercise habit, you are well on your way to reaching your confident and healthy life goals. Sample Entry: Walked 3 miles in the morning, about 45 minutes. Had to force myself to get out the door. Felt OK overall, sluggish at first but good by the end. A little tired after but my mind felt clearer. Proud of myself for doing it! Bought new sports bra. Was going to dance later but ate too late and felt sleepy. Bit bummed I didn't do more, but glad I did some exercise today. Will plan to eat dinner earlier tomorrow so I leave time for dance and free weights. Sharing what you are feeling can be the most powerful and meaningful information in your exercise journal. It is a great way to encourage yourself to stick with it and to see your progress. Use that information to create the "best case" scenario situation so you can commit to working out when your energy is decent and to when you are most likely to actually move your body. When looking for patterns in your exercise journal, observe if you had more energy in the day after you had a lighter dinner or if you had more endurance when you worked out in the morning vs. the afternoon. Look at your food journal for additional information. Try to draw loose associations between what you ate, how you slept, what you did the day before, and what time you worked out. You may be surprised to see how you gradually build endurance and strength and that you are sticking with your plan most days. It can inspire you to keep going. It can even help you start again and regroup after hitting a rough patch. Tip: Get yourself a pretty exercise journal that you will USE. Make it a pleasure to write down what you did each day. Showing yourself that you care about your health and your goals builds self-trust and is nurturing. Even if you didn't do anything, jot down how you felt and why you did or didn't do something. Write down what you plan to do tomorrow. It's not about being perfect, it's about focusing on a goal and working on it day after day. Focus on being consistent and praising yourself for your efforts! The most important part of creating an exercise habit is showing up and that includes writing in your journal. You'll have more energy some days than others, but knowing that you did something most of the days shows your commitment to yourself and your goals. And that will make you proud of yourself and build confidence. Keep up the good work in reaching for your dreams. Walking for Exercise - Get Going! What Does Living a Healthy Lifestyle Mean?